The oil industry was never convinced by Prime Minister Neville Chamberlin’s “Peace in our time” speech of September 1938. They thought that war was inevitable and that they would be nationalised. To avert the latter they voluntarily offered to pool all their resources together instead of competing against one another. This included the sea going tankers, refineries, road and rail tankers as well as offices and staff. On the 3rd September 1939 war was declared and almost immediately the “Pool” plan was implemented. This was headed by the government’s Oil Control Board. This body set both the price and octane rating of the petrol which was simply called “POOL” with brand names disappearing altogether. However, due to the specialist nature of grease and oil products their distinctive trade names were kept. There were two types of Pool petrol; Private and Commercial, rationing had been introduced for private motoring two weeks after war was declared however commercial use was unrestricted. 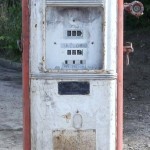 Commercial petrol was dyed red and the penalty for using this for private motoring was imprisonment. Rationing was done on a coupon basis and black marketeering was rife. The manufactures of petrol pumps turned their factories over to manufacturing products more important to the war effort, with the exception of the Beckmeter Model C. This pump was supplied to the M.O.D for refuelling the lorries on airbases both British and later American. 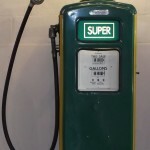 The war in Europe came to an end in May 1945, however petrol rationing carried through to May 1950, Pool petrol remained until February 1st 1953.